Audience/Genre: Historical Fiction, Young Adult. Publication: March 4th 2014 by HMH Books for Young Readers. Wow! This book really made me glad for modern medicine. This isn’t my normal go to book. I like romance. But I am a nurse, so it really intrigued me. There is romance here but it really isn’t the main point of the book. This is about the Epidemic of the Spanish Influenza (the flu) of 1918. Cleo is almost 18 years old. Her parents died when their carriage had an accident when she was a small child. Cleo had to leave on foot and find help because no one would find them if she didn't. She is now under the care of her older brother,Jack, and sister in-law. Jack’s anniversary comes up and He sends her to stay in the dorms of her school while he and his wife go celebrate their anniversary. While away, everything starts to be quarantined and shut down until further notice because of the flu. Cleo decides to go home, but since her brother isn’t in town to pick her up as the school requested, she sneaks out. She ventures out and volunteers with the Red Cross. She goes to homes to make sure people have masks and information about the flu and find people who have no one to take care of them. She finds some people and takes them to a make shift hospital set up at the auditorium. At times, she wants to quit. It was overwhelming the people dead and dying and what she learns. She makes friends. She meets Edmund who is working hard to save their lives and he cares for Cleo. He is the love interest. There is a lot of pain and suffering and hope and loss. But I really liked that she was dedicated and worried. But you could also tell she was in shock often.She sees death and dying all around her and it is overwhelming. Like it was really all some horrible nightmare. The medical part made me glad that I wasn’t a nurse back then. I have seen people die of the flu before but not like this. It is a story that sucked me in until the very last word. "You wonder why I stay", I said. "Sometimes I wonder too. But I hate to think of a child, of anyone really, lying somewhere sick and scared, waiting for help that does not come." 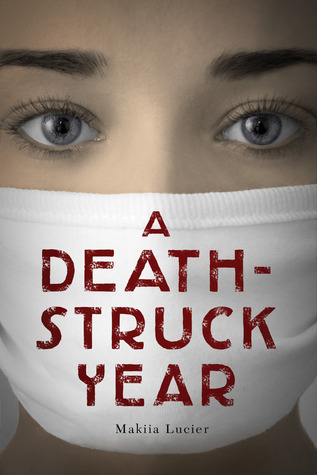 There is a tour-wide giveaway for a SIGNED COPY of A DEATH-STRUCK YEAR to one winner – US ONLY. Giveaway ends on March 17th at 11:59 p.m. Pacific. Makiia Lucier grew up on the Pacific island of Guam, not too far from the equator. She received a bachelor's degree in journalism from the University of Oregon and a master's in library studies from the University of Wisconsin-Milwaukee, where she studied literature for children. She's had plenty of jobs, mostly in libraries, and currently resides in the small college town of Moscow, Idaho. I'm fascinated by the flu pandemic of the 1910s. That whole decade is so interesting because you've got this weird flu virus which is not acting normal, you've got WWI going on at the same time in the same place, plus next door you have the Spanish Civil War raging on. There were a lot of changes then! It is fascinating! Pandemics are both terrifying and interesting. We think of them primarily as problems of the past, but the fear exists that we could have a pandemic in the modern age that resists our current medicines.